Produced by Seven Arches Publishing in partnership with The Portico Library, Manchester, this unusual book has four different time travel adventures featuring early Portico founder members. These stories are written by four different authors and each are followed by winning entries from The Portico Library Sadie Masey Awards 2018*, a book review competition for school children. Consequently, book reviews are a theme that threads through this thirteenth story in the Time Traveller series. However, page-turning suspense and the intrigue for each individual story is provided by the protagonist for the whole series, Danny Higgins. At the age of seventeen, Danny is too old to carry out time travel missions for the mysterious organisation from the future called SHARP, for whom he has been working in secret for the last five years. Danny recruits and organises the young time travellers who in turn go back in time to meet John Dalton, the scientist who chemically proved the existence of atoms, Robert Peel, a British prime minister and founder of the police force, Elizabeth Gaskell, writer and Peter Mark Roget, who compiled the Thesaurus. 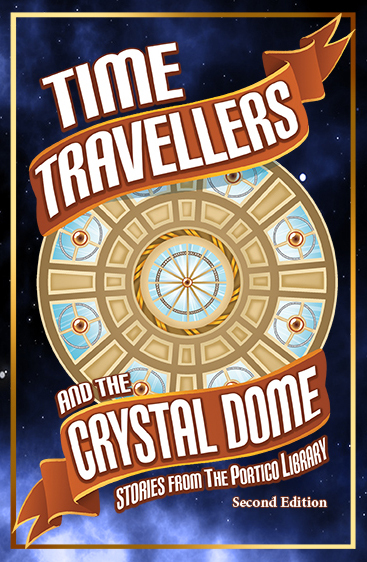 Danny knows that these missions all have a deadly serious purpose, but he does not know why the Crystal Dome in the Portico building might hold the key to averting the impending chaos facing mankind. *NB The children's book reviews featured in this edition are from Jacob Oliver, Katie Bennett, Amira Hassan, Juliette Aznar De Jongh and Matty Thompson. Also included are short stories by Dorothea Tite Ahern, Evie Morton and Lucy Walmsley.